After the successful introduction of Silinvar® technology powered Patek Philippe Annual Calendar watches with the caliber 324 S IRM QA LU, the legendary Swiss watch manufacture now incorporates its “Advanced Research” technology to the legendary selfwinding caliber 240 with a perpetual calendar. 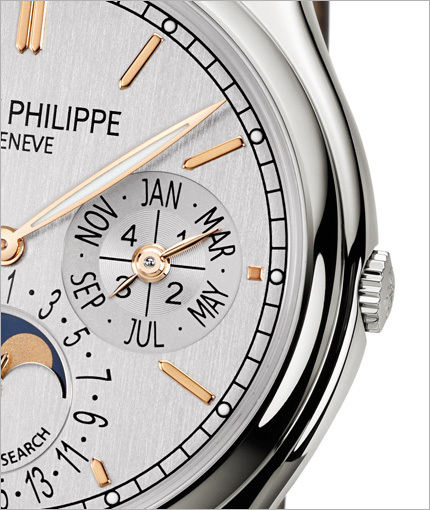 The New Perpetual Calendar Ref. 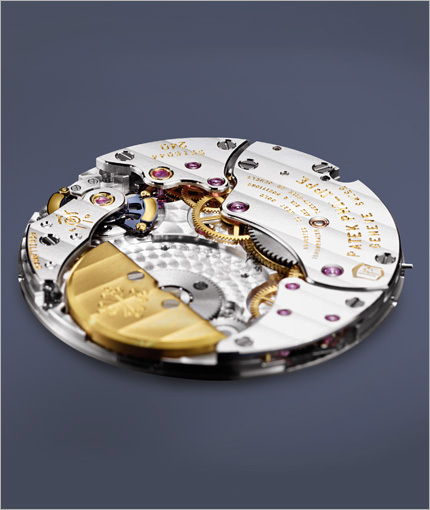 5550P is powered with innovative Oscillomax® subsystem and incorporates the following Silinvar® components: the patented Patek Philippe Spiromax® balance spring, the patented Pulsomax® escapement, and the patented GyromaxSi® balance. Patek Philippe has applied for a total of 17 patents in conjunction with the Oscillomax® subassembly as a whole and also filed patent applications for its individual components. The ultra-thin self-winding caliber 240, with a history of over 30 years is an ingeniously designed movement that enjoys cult status among aficionados. This movement has plenty of potential to accommodate the advantages of Silinvar® technology. In the version with the perpetual calendar (Q) that advances the date, day of week, and the moon-phase display on a daily basis as well as the month and year, the movement must generate a considerable amount of energy. The Caliber 240 Q Si, with power reserve from 48 to 70 hours, incorporates a perpetual calendar and silicon technology. 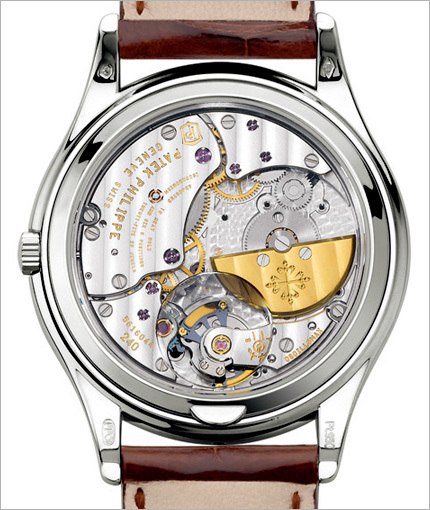 A total of 17 patent applications were filed by Patek Philippe for the components of the Oscillomax® system.This technology accounts for a significant increase of energy efficiency attributable to the innovative Oscillomax® subsystem, particularly of the Pulsomax® escapement and of the GyromaxSi® balance. This gain is based on the perceptibly lower mass of Silinvar® parts compared to conventional components, on the optimized geometry of the lever and escape wheel, and on the much improved aerodynamics and mass distribution of the GyromaxSi® balance, to mention just some of the key reasons. Less energy dissipated means greater efficiency as demonstrated by a power reserve increase of about 50% without having necessitated any modifications of the mainspring, the frequency, or the moment of inertia of the balance. The efficiency of the winding train has also been perceptibly improved. The third element of the Oscillomax® ensemble is the patented Spiromax® balance spring made of Silinvar®. Based on its superior material properties and its patented geometry with the Patek Philippe terminal curve, integrated collet and integrated stud attachment, it delivers a significant improvement of isochronism. It not only breathes symmetrically despite being flat, but is also antimagnetic, corrosion resistant, and extremely insensitive to shocks. Additionally, with no trade-off in terms of isochronism, the Spiromax® balance spring is three times flatter than a Breguet spring, making it ideal for ultra-thin movements. With the sum of all these characteristics of the individual Oscillomax® components, the caliber 240 Q Si features a considerably improved power reserve combined with exceptional rate accuracy. It goes without saying that the Ref. 5550P perpetual calendar of the “Patek Philippe Advanced Research” series is subject to the same strict criteria defined by the Patek Philippe Seal that specify a maximum daily rate deviation of -3 to +2 seconds per 24 hours for all mechanical watches with a diameter of more than 20 mm. In a limited edition of 300 watches, the Ref. 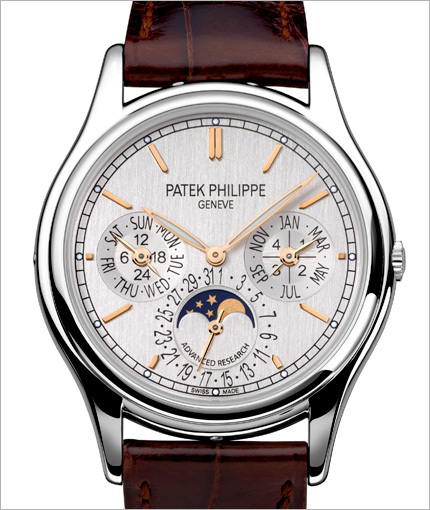 5550P perpetual calendar is a superb manifestation of how tradition and innovation go hand in hand within the scope of the “Patek Philippe Advanced Research” design concept. It brings to the fore unique functional advantages such as the extended power reserve, the high rate accuracy, true dependability, and convenient serviceability. 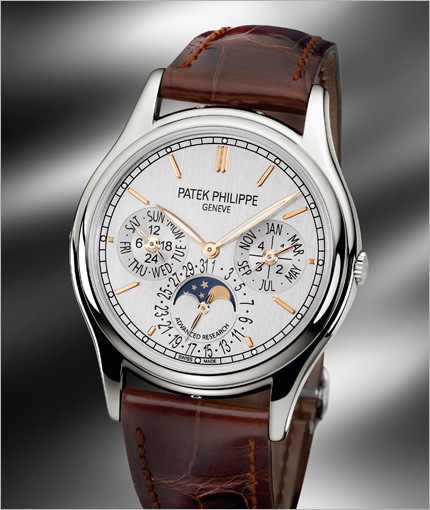 The special-edition “Patek Philippe Advanced Research” perpetual calendar has a power reserve of up to 70 hours. The exterior elements are equally sophisticated. The Calatrava-style case with the curved lugs and the rounded bezel is crafted in-house from 950 platinum using traditional cold-forming techniques. As an exception, because the correction push piece for the moon-phase display is located between the lugs at 6 o’clock, the typical 0.02 ct. diamond that identifies Patek Philippe’s exclusive platinum watches is positioned at 12 o’clock. 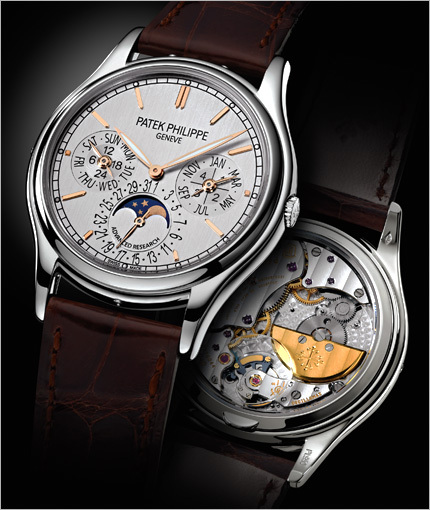 The dial is timelessly contemporary and with many refined details suggests the avant-garde technology hidden beneath it: a cool silvery gray face with a vertical satin finish, a crisp railway track minute scale with applied luminous hour dots, straight obus hour markers in 18K rose gold, slender leaf-shaped hour and minute hands with Superluminova coatings, the PATEK PHILIPPE GENEVE signature, the ADVANCED RESEARCH inscription, and calendar scales in a modern sans-serif typography style. It is an eminently legible, classically elegant face with novel accents that will inform future generations of the horological quantum leap which took place in 2011. The revolutionary escapement can be admired through the sapphire-crystal snap back. Over the Oscillomax® subsystem, the back features a loupe that magnifies the innovative components. It affords close-up views of the purple-blue shimmer of the Silinvar® material, the unusual shapes of the escape wheel teeth and pallets of the Pulsomax® escapement, and the radically new geometry of the GyromaxSi® balance with the attractive contrast between Silinvar® and 24K yellow gold. In compliance with the Patek Philippe Seal, these components are embedded in a movement lavishly finished by hand to the highest standards of watchmaking artistry, featuring manually executed decorations, gently rounded and polished chamfers as well as gold-filled engravings. The traditional finishing touch: the hand-stitched brown alligator strap fashioned from the finest parts of the hide with large square scales is comfortably and reliably secured with a 950 platinum fold-over clasp. Perpetual calendar with analog displays for the day of the week, date, month, and leap-year cycle. Moon phases and 24-hour display. Hand-stitched alligator leather with large square scales, shiny chocolate brown, platinum foldover clasp.